You’ll never guess the secret ingredient in this healthy dip! If you’re headed to a Football party this Sunday, you’re probably expecting to find plate after plate of high-calorie, low-nutrition game day eats. But worry not! 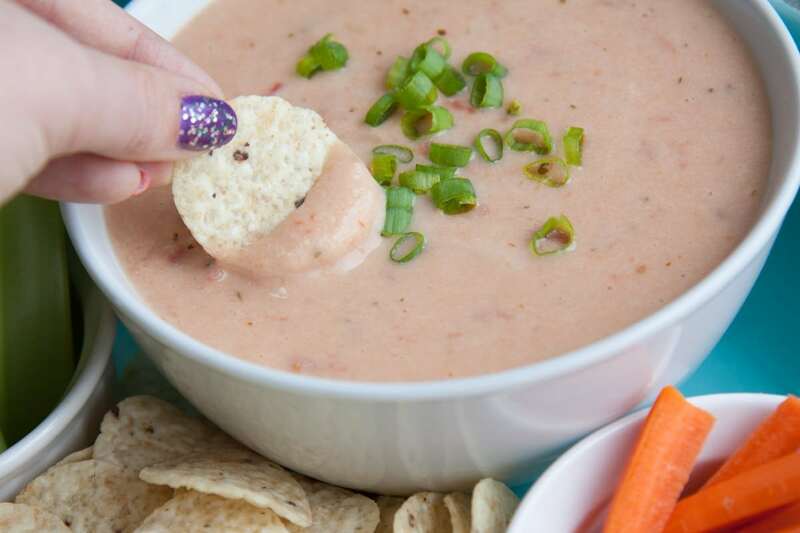 You can bring your own addition—this high-protein, healthy queso dip! Many of your standard queso dips are packed with sour cream, butter, and pounds and pounds of cheese; but this version uses a secret ingredient for it’s base—a can of blended beans! The beans provide a creamy, thick texture to the dip, but also add a ton of fiber and protein without a ton of calories or unhealthy fats. And thanks to its bold flavors and a touch of cheese, your fellow party-goers will never suspect it’s anything but game day deliciousness! In a food processor or high-speed blender, blend the beans (including the liquid from the can) on high until very smooth. Depending on your food processor or blender, you may have to stop a few times and scrape down the sides to get it really smooth. In a medium saucepan over high heat, add in the blended beans, diced tomatoes, salsa, green onions, and sour cream. Heat until hot and bubbly, about three minutes. Remove from heat, stir in cheeses until melted, and add salt, pepper, and hot sauce to taste. Serve with tortilla chips and veggies for dipping. Cook’s Note: Shredding your own cheese is the way to go when you’re melting it. Pre-shredded bagged cheeses are coated in special anti-caking agents that tend to make the cheese get stringy and gritty when melted. No one wants gritty queso!